A wild day in le Tour as well as in our own Tour de Fleece. I spent a fair amount of time teaching kids to spin this week, while the cyclists fought it out to win stages and avoid horrible crashes... Some of use fared better than others. I spent a lot of time working down that pound of fiber I scored from Ronnie's Homespun at the Black Sheep Gathering. Here is the latest: Veggie duo, done two ways. The first yarn is a worsted to bulky 2-ply and the second is a sport to dk-weight of the same fiber. Isn't it cool to see how different they look? Or perhaps I am the only fiber nerd here. The big news of the day for me is that, unlike last year, I made the deadline to submit yarns to the 2007 LA County Fair for judging. Last year I entered 3 yarns (late) and won 3 ribbons! Here's the scoop, in case you missed it. 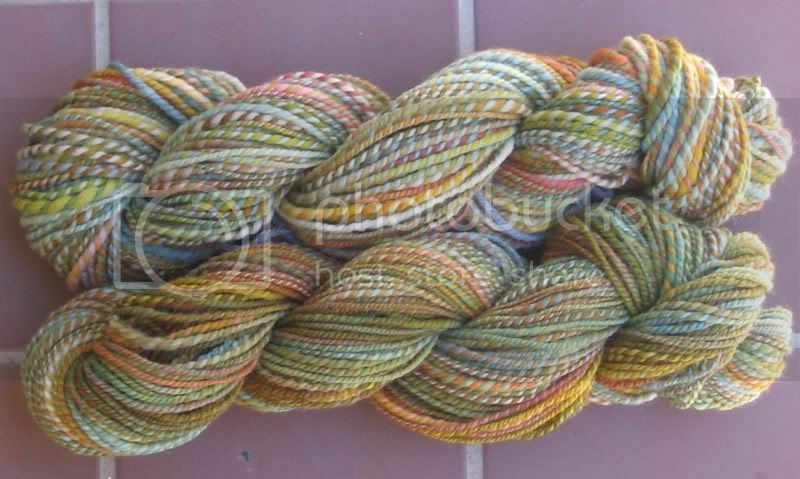 I have more yarn to show, but will wait for tomorrow, Fiber Friday. Despite a bad toe that has nothing to do with anything, I will keep on spinning! How is the rest of the peloton? That is beautiful, you did a great job on it! That is neat! I'm surprised by how different they look, actually- the second one looks a lot more orange. Well done!